The World Cup is one of the world’s best parties. It helps if your home nation is represented on the pitch, and it’s better if they’re good. I had planned to make it to South Africa 2010 but as tricks turned out, I didn’t. Instead, here’s a quick story from four years ago, when I slipped over to Germany for the 2004 tournament. This event occurred pre ‘Trail of Ants‘, and it’s actually the first travel story I’m sharing with you from behind the odyssey I’m currently enjoying. If you’d like to hear more from my European adventures, let me know via the comments or flick me an email. We had it all planned out. 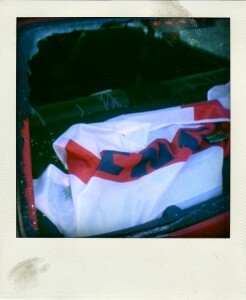 Five torsos dressed in mighty white England shirts, cloaking five hearts beating to the chime of Three Lions. Visions of German skies giving way to a tempest of red and white flags, and a travelling nation reaching fever pitch with every shimmy Becks would make. Five became four. He couldn’t afford it. Four became three. His girlfriend couldn’t be alone. Three became two. Just me and my boyish house mate, Jeff remained. Two days later, enveloped in the silence of a pre-dawn, I rammed a bag of clothes and three bags of little extras into the boot of a red Peugeot 106 I’d bought on eBay a month before, while stupendously drunk. I proudly turned the ignition and clenched the wheel: “I name thee Tonto. For I, am the Lone Ranger” I mumbled, before releasing a series of toots as I pulled onto the road. Destination World Cup. I drove uneventfully through England, France, Belgium and Luxembourg before slipping onto the Autobahn for the final leg of the 700 mile pilgrimage. Schnitzels and cigarettes lined my wake while impassioned, 100mph exchanges with travelling fans floated me into central Stuttgart. Stuttgart was instantly easy going. A large city, but easily navigated during the festival. A sea of tents and bare-chested England fans ebbed and flowed on the horizon, drawing me into the expansive car park they had colonised. I stretched my limbs as far as they would allow and registered with the campsite. “Anywhere?” I questioned. “Wherever you can fit” he replied. It was a relief to have found my clan so easily. The city was alive with the world’s best, and most famous football fans, and I was eager to get involved. I restarted the engine, and stared out across a mass of England fans, unsure how I would navigate my way through this collage of sprawling tattoos and deckchairs. I reversed at speed, then slammed to a sudden halt. A fast thud gave way to a slow crunch. Beads of broken glass peppered the back of my skull. My body stiffened, and the scene I’d been looking at seemed to freeze instantly. A flurry of senses darted through me: relief, as I judged I hadn’t hit anyone; joy, as I was handed my first beer through an open window; confusion, about exactly what had just happened; and annoyance, because I’d just driven for thirteen hours, and this was the last thing I needed. I took a swig of beer, and slipped out of Tonto to face the crowd of burly strangers who had gathered like coyotes around a slab of destroyed prey. There was glass everywhere, and a long shadow carved through the ground. The shadow of the 60-foot high lamppost I’d failed to see. The World Cup in Germany was an amazing experience, and although I’d travelled solo extensively before, it rendered my love of independent travel. The accident actually wrote my car off, kicking off a series of events. Despite the back-end being crumpled and smashed, the following day I managed to drive it to a distant family relative in Belgium. Pride reinstated, I grabbed a month long rail pass and headed back to my clan, and my bruised ego was quickly heeled by hot sun and cold beer. Following our loss, I escaped the tournament. Heading to the far north of Germany, to the bleak German island of Sylt. A few weeks later, I received a cheque from my car insurance company, for three times the amount I’d paid for it in that merry eBay exchange.